One Line :- Jully had a magic color pencil,which draw picture automatic cally. The mouse became upset and said :- " Cat ! Cat !" Jully had a magic color pencil,which draw picture automatic cally. 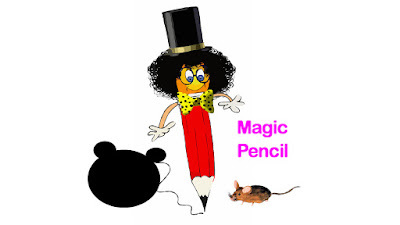 one night a mouse came and began to nibble at the pencil. "Dear mouse .........do not nibble at me.......i shall draw pictures"
The mouse became very happy.the pencil began to draw pictures.It made a circle. The mouse said :- " This is an apple!" After the some time pencil made oranges. The Mouse said:- " Please make haste." The pencil made two ears on the circle. The mouse became upset and said :- " Cat ! Cat !" The Mouse at once ran into a hole. Friends, if you like this Article then Please don't forget to share with family member and friend. and if you like this post please comments.